Akit's Complaint Department: Lighters allowed on planes? Is our government really that stupid? Starting now, you are allowed to bring on your possession, a lighter on your person when going through security screening. The question I'm wondering... WHY? 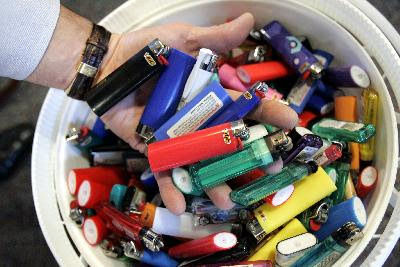 Sure, the government says that they collect 20,000+ cheap-o lighters every day and it costs them $4,000,000 a year to dispose, but isn't it just a good idea? I'm not a smoker, but it seems to just be simple common sense to ban all lighters from your carry-on, but it is OK to put in your check-in baggage, which they have looser restrictions on items like pocket knives. Now, if you are a smoker, why doesn't our government give $4 million dollars a year's worth of nicotine gum for those who got the cravin' but are not allowed to smoke? Anyway, it's just simple common sense. Eliminate fire, eliminate the risk of a nasty fire by using hard liquor they sell on-board. Sometimes it is worth asking yourself, is $4 million worth saving people's lives, I say it is. I don't think that lighters pose a serious security risk. A lighter does not contain enough energy to cause any significant damage to an aircraft (unless a fire is started). The liquor sold on board is not of a strong enough proof to be flammable (80 proof vodka is 60% water), and even if it was flammable the max a row of determined terrorists could obtain is 4.5 ounces (1.5 ounces per bottle*3 in a row). Hardly enough to do damage if there was anyone paying attention on board, and nothing a couple glasses of water couldn't extinguish. The only time i could imagine a lighter being able to create significant damage is if a terrorist managed to smuggle a bomb on board, which a lighter would be the least of our concerns in that situation. There are many ways to start a fire with materials allowed on the plane (such as shorting out a laptop battery or a cellphone battery, not only would they start a huge fire but they'd explode decently too). I'm all for smart security measures but clogging up the system looking for stupid things like lighters and toenail clippers isn't making anyone safer it's a feel good tactic. Not only does it waste time it wastes money (the taxpayers who have to dispose of the lighters and the travelers who are forced to replace the lighters when they land), it's also puts an unnecessary strain on the environment (for example BIC lighters are made in France with of course metal, plastic, flint, and butane, it is then imported to the US by ship, driven to the stores, blah blah blah. just to be thrown away). Basically is what I'm saying is that battery in your cellphone or laptop is a hell of a lot more dangerous than that lighter in your pocket, confiscating the lighter is just another stupid thing that the TSA does to make you feel better about a situation that really cannot be controlled, and it's just an all around waste. "I'm not a smoker, but it seems to just be simple common sense to ban all lighters from your carry-on, but it is OK to put in your check-in baggage, which they have looser restrictions on items like pocket knives." Your checked in baggage goes through a lot of punishment and I don't think the TSA wants lighter fluid all over cargo holds.